2016 EU reissue on 180g LP +download=STEREO=-The groundbreaking Pet Sounds is undoubtedly The Beach Boys' most acclaimed album and arguably the most influential pop record of all time. The best Beach Boys album, and one of the best of the 1960s. 2016 EU reissue on 180g LP +download=STEREO=-The groundbreaking Pet Sounds is undoubtedly The Beach Boys' most acclaimed album and arguably the most influential pop record of all time. The best Beach Boys album, and one of the best of the 1960s. This is the album that took the group and music in general to a another level, both in terms of composition and production. Layers of music tracks stacked upon incredible vocal harmonies helped create a rich sound full of depth and pure emotion. The best Beach Boys album, and one of the best of the 1960s. The group here reached a whole new level in terms of both composition and production, layering tracks upon tracks of vocals and instruments to create a richly symphonic sound. Conventional keyboards and guitars were combined with exotic touches of orchestrated strings, bicycle bells, buzzing organs, harpsichords, flutes, Theremin, Hawaiian-sounding string instruments, Coca-Cola cans, barking dogs, and more. It wouldn't have been a classic without great songs, and this has some of the group's most stunning melodies, as well as lyrical themes which evoke both the intensity of newly born love affairs and the disappointment of failed romance (add in some general statements about loss of innocence and modern-day confusion as well). The spiritual quality of the material is enhanced by some of the most gorgeous upper-register male vocals (especially by Brian and Carl Wilson) ever heard on a rock record. "Wouldn't It Be Nice," "God Only Knows," "Caroline No," and "Sloop John B" (the last of which wasn't originally intended to go on the album) are the well-known hits, but equally worthy are such cuts as "You Still Believe in Me," "Don't Talk," "I Know There's an Answer," and "I Just Wasn't Made for These Times." 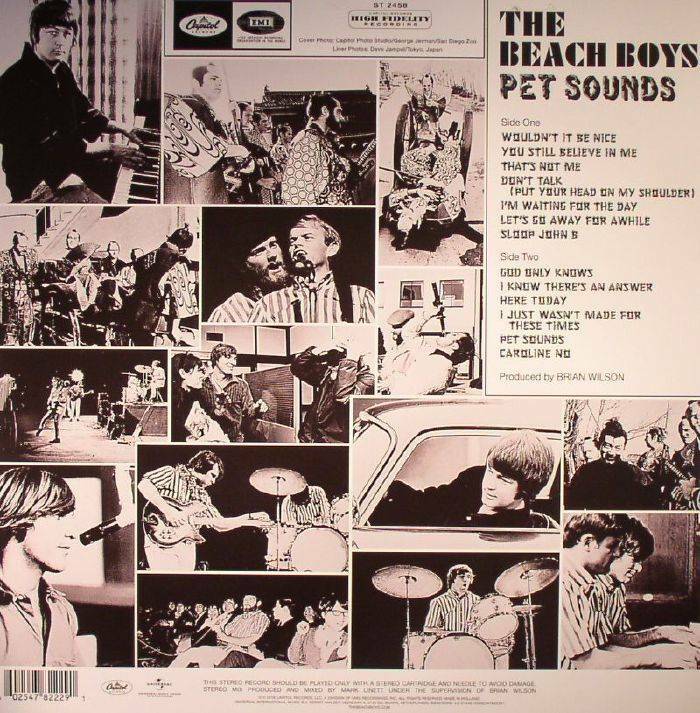 It's often said that this is more of a Brian Wilson album than a Beach Boys recording (session musicians played most of the parts), but it should be noted that the harmonies are pure Beach Boys (and some of their best). Massively influential upon its release (although it was a relatively low seller compared to their previous LPs), it immediately vaulted the band into the top level of rock innovators among the intelligentsia, especially in Britain, where it was a much bigger hit.